dhcp Archives | It`s full of stars! My internet provider is Unitymedia. Their default router comes with a DHCP server. Honestly, it’s one of the worst products I ever had to work with. My private network is 192.168.0.x. The DHCP server of the Unitymedia box is distributing from time to time leases for 192.168.192.x. Changing my private network to 192.168.192.x one is not working, as then the DHCP server picks another address range. Advise from Unitymedia help desk was to reboot the box, which, of course, won’t solve the problem. Because of this error, some of my devices are in a different network: Chromecast won’t work, broken internet connection on smartphones, etc. I do have a Raspberry Pi (RP) in 24/7 use. My idea is to run my own DHCP server on the RP. This not only solves the DHCP problem, but also gives me more control over the DHCP configuration. 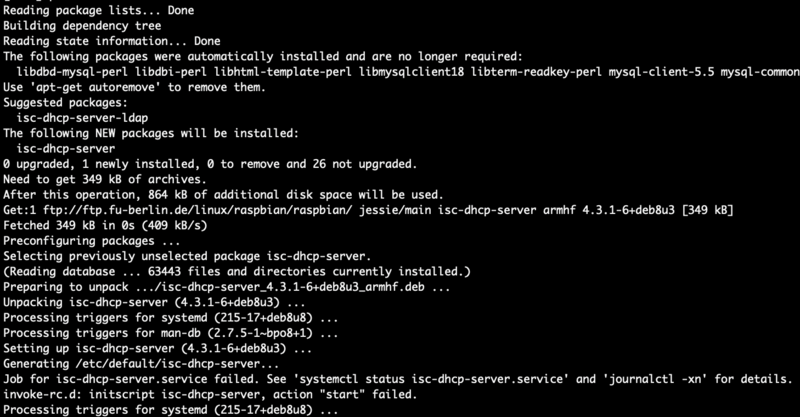 This installs ISC DHCP server. As you can see in the output, starting the DHCP server failed. The error is simply caused because the DHCP server is not configured. Let’s change that. Several parameters must be activated and configured. This configures what IP address are going to be distributed. My private network is 192.168.0.x with the router on 192.168.0.1. As DNS you can use whatever you want, as an example I am using Google DNS servers. This will give DHCP clients an IP address between .150 and .240, with router .1, Google DNS and sets the domain name to my own. To not have the DHCP server provided by Unitymedia box still issuing wrong IP address, I am going to deactivate the service via the web interface. After installing and configuring the new DHCP server on RP and deactivating the one from the router box, it’s time to start the new DHCP server. Putting my Android device into flight mode and back makes it connect to Wifi again and obtain a new IP address via DHCP. In the DHCP status log, I can see the DHCPDISCOVER from the Android device and that it got the IP address 192.168.0.150 assigned. As my Mac always got the wrong IP assigned, I changed it to manual configuration. Change the mode to DHCP, apply and deactivate / activating Wifi. And my soundbar that got a strange IP address assigned by the Unitymedia router box? Works too! Chromcast streaming shows the SoundBar is now in the same network.